'Outlander' Season 4 Episode 5 Recap: "Savages"
Starz’ Outlander season four episode five, “Savages,” will make you question just who is really the savage in the new world. To me it was a classic example of how the divisions between the Natives and the Settlers could be so profound and cause complete devastation. We might just get a blast from, and to, the past. But I’m getting ahead of myself, let’s start from the beginning. Je Suis Prest! In North Carolina, 1768, Claire (Caitriona Balfe) and Adawehi (Tantoo Cardinal) are trading medicinal secrets and languages by a river on Fraser’s Ridge. Adawehi asks Claire if she’s had any children, and Claire reveals she does have a daughter but she’s far away. Adawehi says her daughter is ‘here,’ and Claire takes her to mean in her heart. I suspect Adawehi meant something more physical than emotional. But no proof of that, so we go back to the cabin. Claire’s preparing to head to the Mueller cabin to assist with a delivery. In the book, we experience the eldest male Mueller, Gerhard (Urs Rechn), prior to the maternity of his daughter. Jamie (Sam Heughan) had a tussle with him in Willum’s Creek nearby. The German felt the lady in the store had shorted him grain and got physical as a result. In the show, Claire’s preparing her medical needs for heading to the Mueller family settlement as Jamie’s preparing to head into Willum’s Creek to find settlers for the Ridge. 10,000 acres require lots of hands to work the land. With the Fraser cabin fully erected, additional settlers are the next order of business to getting the farm fully functional. Jamie’s also working on a surprise for Claire. He sneaks his mother’s silver candlesticks into a satchel without Claire seeing. As Jamie’s helping Claire on with her coverings to protect against the weather, he gives her a rather odd look. Claire asks what it is that he’s thinking, and he asks an extremely unexpected question. He wonders if Brianna (Sophie Skelton) had a birthmark on her neck. That throws Claire off balance a bit because she hadn’t mentioned it to Jamie before. Jamie reveals he saw it the previous night in a dream and describes it to Claire exactly. He explains he kissed Brianna on the mark in the dream. The pair embrace, as you might expect, full of emotion over their distantly separated daughter. In 1971 Inverness, Roger (Richard Rankin) is also full of emotion over Brianna, though for obviously different reasons. Roger heads to the taxi office for news of her movements and finds validation that she was taken to Craigh Na Dun. He also discovers she’s been picked up from a small bed and breakfast place in Inverness. Roger asks if Brianna left anything behind. The owner initially was asked to wait a year before sending Roger a letter, but she decides to give him the letter right then since he’s already there. Roger becomes upset, obviously. All his discoveries point to his worst fear being realized. In Willum’s Creek, Jamie and Ian (John Bell) look for settlers for the Ridge but find something’s amiss instead. Ian takes pamphlets off to get men to come to the tavern so Jamie can speak to them collectively, as Jamie heads to the silversmith with his candlesticks. The smith’s not in, so Jamie heads to the tavern. At the Mueller settlement, Claire’s completes the delivery and passes the fresh angel into her mother, Petronella’s (Marie Hacke), arms. The new granddaughter’s named Claira after Claire, which takes her fully by surprise. They declare the child is a granddaughter to Claire as well since she has none of her own. At the tavern, Jamie’s explaining the terms of the agreement to settle on his land at Fraser’s Ridge. An extremely fair, even generous, deal by all accounts. The men still reject the offer immediately. Ian and Jamie are both surprised by the rejection of all six men. Jamie realizes something more’s going on and takes the typical Scot’s tact of finding out: he buys one of the men a pint and they speak of clan and land in Scotland. They also speak of the rising and imprisonment after. The Scot named Bryan (Martin Donaghy) explains the taxes plus the dishonest men representing Governor Tryon are the cause of all six men losing land and livestock they previously had in smaller settlements of their own. At the Muellers’ cabin, the men of the house meet the new arrival. Gerhard Mueller picked up a tiny doll in Cross Creek for his granddaughter. While all are marveling at the new addition, Rollo lets out a massive deep bark and alarms all in the cabin. The men spy Natives in the creek gathering water and arm themselves. Claire tries desperately to make Gerhard Mueller see reason, but as Jamie found out all to well, the man was hard to make see anything else once he has his mind on a particular idea of the situation. Claire heads outside with the men and insinuates herself between all involved. 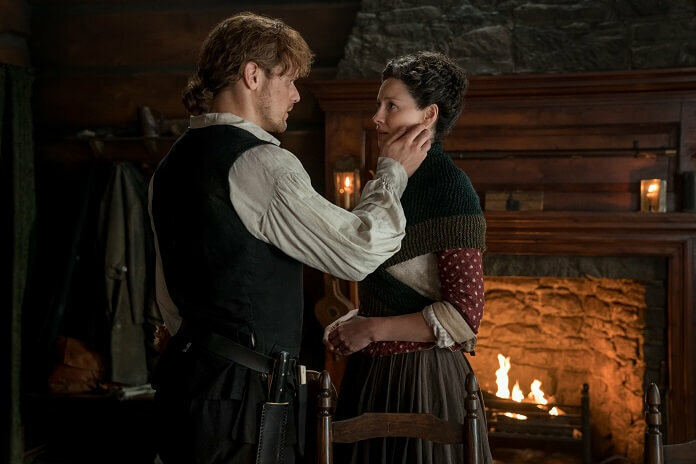 All men raise weapons, but Claire makes the Cherokee understand she’s the wife of Bear Killer, aka Jamie, and they know her to be a friend to Adawehi, their medicine woman. At her request all men lower their weapons, and she talks the Natives into going to another part of the creek to water their horses. As they’re leaving, Tawodi (Will Strongheart) sprinkles something over the water and riverbank. Naturally, the German men don’t understand what that means and believe he’s doing something bad to curse the water. Claire tells them it’s just a way of blessing the waters. Claire and Rollo head home to Fraser’s Ridge and Claire enters the cabin to collapse on the bed. In the book, it was that journey home that had Claire lost in a storm and seeing the ghost Indian that we saw in season four episode three, “The False Bride.” In the show, the next morning Claire returns to farmhand-mode instead of healer. Livestock require tending and she works a bit at drying her herbs and knitting. A farm has many chores to pass the time, but how would the time be for our Sassenach without sitting down to a glass of whiskey in the mix of things? Slainte Mhath! Ian and Jamie prepare to head back to Fraser’s Ridge and discover a bit for one of their horses is broken. Jamie sends Ian to the blacksmith to get it fixed before they can leave. Ian enters the shop, but the blacksmith’s preparing to close for the day. The hair might be stark white, but the voice is unmistakable. Our surly stubborn beloved Murtagh (Duncan Lacroix) is none other than the tradesman himself. Naturally, Murtagh knows nothing of Ian; the lad had just been born before Jamie had been imprisoned in Ardsmuir. In the book, Murtagh didn’t survive the rising’s final battle at Culloden Moor. It appears the show replaced another fellow captive in Ardsmuir, Duncan, with Murtagh. Duncan was a fellow prisoner with Jamie in the book and traveled to America with them, though he only had a single arm. Duncan served to be a bit of a gopher for Jamie in the book but was a close friend to the Frasers throughout all their various challenges. Murtagh was not just close, he was family; Jamie’s godfather, in fact. In the show, the horse bit must be repaired so Murtagh has Ian over a barrel and takes his entire purse to repair the simple item. The men eyeball each other for a few more seconds before Murtagh turns to do his work. When Ian reveals the cost of the bit to Jamie, of course Jamie’s incensed. He barges right into the shop to call the man out for his actions. As Jamie’s shouting at the man’s back, Murtagh freezes at the voice behind him. He slowly turns, and Jamie lays eyes on his long-lost godfather after more than a decade. With tears in his eyes, Jamie embraces his kin heartily. Introductions are made between Murtagh and Ian for the first time. The obvious declaration of ‘much to catch up on’ is made, so they’re going to retire to a tavern. Back at the Ridge, Claire’s out back feeding the livestock and then heads back to the house when she hears a loud and angry pounding on the door to the cabin. Pastor Gottfried (Albert Welling) has terrible news to share and a warning to deliver. The Pastor explains the young mother and baby both died from measles. The loss of his daughter and granddaughter have driven Mueller crazy. Rosewitha Mueller (Nicola Ransom) believes her husband blames Claire for allowing the Natives to curse their water and fears he will come after her. The Pastor leaves after delivering his warning and Claire returns inside to prepare the long rifle. In the tavern, Jamie, Ian, and Murtagh catch up over a pint. Murtagh explains his indentured service to the blacksmith there, and that the man died so Murtagh purchased the business. Jamie asks Murtagh to work on his silver candlesticks since the other smith isn’t in town. Ian mentions it’s a surprise for Jamie’s wife. Ian has no idea about Claire’s past, but Murtagh does (in the show). Jamie sends the boy to the bar to get another ale and tells Murtagh that Claire has returned. Murtagh also finds out about Brianna. Jamie asks Murtagh to come to Fraser’s Ridge as well. Murtagh explains that many of the people of the community are not pleased with the Governor and the tax collectors, and he can’t leave his business. In the book there was reference to the unrest here and there, but not as fine a point placed on it during that period of time. Murtagh rejects the offer to settle on the Ridge and invites Jamie to join him at a meeting later that night. It turns out Murtagh is leading the local Regulators. Jamie’s not pleased to see his godfather leading the mob after the Governor had asked him to quell any uprisings. Murtagh asks Jamie to join them, and it’s Jamie’s turn to reject the offer. The next morning Mueller arrives at the Ridge. Claire’s extremely scared, but Mueller reveals his arrival is out of concern for her – not to blame her. Claire tries to tell him the Natives didn’t curse the water; it was the measles themselves that traveled most likely from Cross Creek. Mueller will hear none of it. He’s certain the Cherokee cursed the water. Mueller gives Claire a wrapped packaged as a gift and she initially believes it’s baby Claira’s doll. When she opens it up, the gift is of scalps instead. She sees the belt Adawehi wore beneath the hair. A shouting match ensues between the pair culminating in Claire asking the man to leave. In the book, Claire was not facing the man alone. Lord John Grey was with Claire, recovering from the measles he contracted. A glimpse of that storyline is shown in the preview for the next episode. In the show, Claire takes the scalp of Adawehi and places it in a box to ritually burn the remains. At the same time fiery arrows are shot into the Muellers’ cabin by the Natives in retaliation for the murders committed by Mueller. Gerhard and his son arrive home to see his wife and cabin burning. The Cherokee strike them down with arrows as well while they watch the cabin burn. The next morning Claire’s in her bed alone and hears Rollo bark. The next thing she hears is Jamie shout “Sassenach,” and I’m sure it set her heart soaring. She puts down the gun and opens the door. Jamie’s all smiles until he notices the distraught expression on Claire’s face. Jamie runs straight to her without a word to scoop her into his arms. He then asks what’s wrong and she says she just wants to be held. Some time later – it could be days – Claire’s out gathering wood and she hears someone whistle “Boogie Woogie Bugle Boy” behind her. Claire turns to see Murtagh. They embrace, laughing, and enter the cabin arm-in-arm. At the end of the episode we find out what was in the letter Brianna was expecting to have sent to Roger a year after she departed. We see Brianna standing in front of the stones just as her mother had done multiple times before. The letter was her goodbye to Roger and her confirmation that she’s discovered something bad had happened to her parents. She’s following her mother’s path to warn them. She takes a last look around the hill before placing her hands on the stone and vanishing. As I mentioned in the beginning, could you tell who was the savage in this week’s episode? Often people died in those early settlement years in America due to misunderstandings and lack of tolerance of something each could not comprehend. Both acted savagely, but both felt they did so for profound reasons. Murtagh is back so that makes everything right with the world again! The next episode will find Brianna in the past for the first time in her life. It’s going to seem like a very long wait until we get to see it. What action do you think Roger might take?